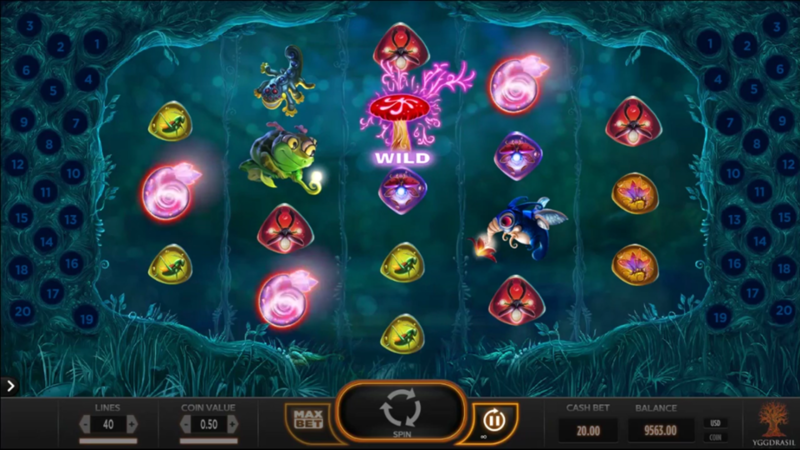 Online since 2014, Yggdrasil Magic Mushroom is a 5-reel video slot machine with 40 paying lines featuring Wilds, Spreading Wild, Random Multiplier Wilds and Free Spins that you can use when trying to reach a jackpot of up to 800.000 coins. You can try it in the free play mode or start playing for real after reading the Magic Mushroom slot review and implementing a few tips and tricks presented here. Want to see how Magic Mushroom works? Select a recommended casino site from the list below and start playing for free or real – our screenshots will give you a sneak peek! You'll get a unique paytable with 5 reels and 20 paylines oriented from left + 20 from right. Also, there is a diamond-shaped table with 3, 4 or 5 symbols per reel and your task is to create a winning combination of 3-5 symbols of the same kind. Thanks to the coin denomination from €0.01 to €0.50, you can set your own betting strategy and wager between €0.40 and €20 per round. Magical creatures are symbols with the highest rating and you’ll receive 20-1000 coins for a combination of 5 of the kind. Whenever you manage to collect 3, 4 or 5 scatters, the game will reward you with 10, 20 or 75 free spins, respectively. Winners that get 2 additional scatters will receive 2 more extra spins on the top of it. You can benefit from 3 different Wild symbols, of which the regular one does what we have already used to see – substitutes any icon except the scatter from a winning combination. Random Multiplier Wild is able to produce a big win of 2-10x your stake, while the Spreading Wild expands and covers 1-4 symbols to help you form a winning combination faster. This is a mobile-optimized title that you can play for fun on sites powered by Yggdrasil. There is no need to download an app for Android or iPhone to start the demo and learn how to win. 3. What is the RTP factor of Magic Mushroom? The official info is the RTP stands at 96.40%. Built on a table with unique features, the game brings re-triggerable free spins and tons of rewarding features on the top if it. You can always play for fun and switch to the cash gaming where the sizeable jackpot prize will reveal its full potential.